According to the Daily Mirror, the Blues want to keep hold of the Brazil international after his fine start to this season under new manager Maurizio Sarri. Luiz’s Stamford Bridge future had looked slightly in doubt after losing his place under Antonio Conte last season, but he’s now back at the top of the pecking order in defence. Chelsea, however, need to move quickly to tie Luiz down as he would be able to negotiate a free transfer to a foreign club for next season from January onwards. The 31-year-old would likely not be shot of suitors, so it is unsurprising to see reports emerge that Chelsea are already planning talks over extending his stay in west London. David Luiz to land a new Chelsea contract? CFC need their best and most experienced players on board after last season’s struggles that saw them slump all the way down to fifth in the Premier League. 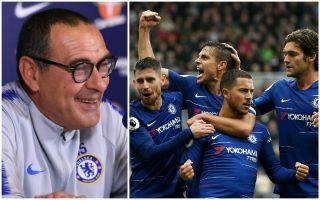 The appointment of Sarri looks to have Chelsea back to their best and among the main challengers for this season’s title, but keeping proven winners like Luiz is an important part of keeping this progress going.